Smooth Automation partners with the best local security providers to offer you enhanced automated options throughout your home. Home security is of vital importance to everyone. 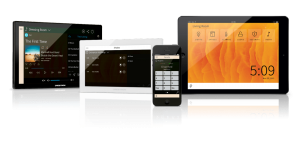 Using the latest in automated and smart home access technology from Smooth Automation, you gain absolute control over whomever has access to your home. At all times. In every situation. Smooth’s security solutions include identification systems that enable you set up access rules for family members, visitors and service providers. Put into place temporary access for casual gatherings, small and large events and, and maintenance tasks. Then easily remove access when the event ends. It is also possible for you to control access to your garage gates and cars. All with the simple touch of a smart device’s touch screen. The system is infinitely scalable. You may add more access points and rules as you go without needing a complete re-configuration of the system. All the visible systems that Smooth provides meet the highest standards of visual design, and will appeal to the most exacting interior designers and decorators with their sophistication and state-of-the-art technology. Give keyless entry to family, friends, maids and other service providers without worrying about lost or copied keys. Regulate access to your home and keep an eye on your doors from anywhere. See who is at the door and interact with them from five rooms away from the safety of your smart, secure home. Your sanctum. Allow Smooth to upgrade your home’s security and safety with smart home locking doors and an automated surveillance system with multiple digital cameras, all controlled with a single device. By you and you alone. Our team possesses the technical knowledge, skills and decades of combined experience to deliver on the surveillance requirements of virtually any type of installation for every conceivable home design and layout. We design and customize each of our projects to meet the specific needs of each client. Contact us today about the latest, smartest solutions to meet yours and your family’s security needs.